Known as the Mountain State, West Virginia is filled with diverse landscapes and stunning scenery, perfect for outdoor activities of all kinds. Ziplining is fast-becoming one of America's most popular outdoor adventures, offering participants of most ages and physical ability levels a unique chance to get in touch with nature and wildlife like never before. Zip line tours send you sailing through the skies at speeds from as low as 20 miles per hour all the way up to 60 or even 70mph in certain cases, offering 360 degree views of beautiful natural environments all around the United States. West Virginia is a great spot to do some ziplining, boasting several top quality zip line tours and experiences for you to try at almost any time of year. River Expeditions - 900 Broadway Avenue, Oak Hill, WV 25901 (800 463-9873) River Expeditions is a super place to stop off if you're interesting in outdoor activities and adventures of any kind. This tour operator provides kayaking, whitewater rafting, ATV rides, mountain biking, fishing, scenic boat rides, hiking, paintball, and so much more, including a really exciting zip line canopy tour called The Ridges. Led by friendly, experienced guides, this 1-2 hour treetop tour is comprised of four zip lines in total, as well a sky bridge and a rappel experience to finish off. Along the way, the guides will answer any questions visitors might have and provide fascinating insight into the area, including fun facts about local flora and fauna. Running through spring, summer, and fall, the zip line tours at Adventures on the Gorge provide more one and a half miles of ziplining action. Visitors really feel like they've been transformed into birds as they glide along from one platform to the next, taking in the incredible views of New River Gorge from heights of up to 200 feet above the ground. This tour starts off with a couple of 500 foot 'warm up' zip lines before getting to the more intense lines ranging between 1,300 and 1,800 foot. These incredible zip lines provide speeds of around 50 miles per hour, before guests finally come to the biggest zip line of all: the Adrena-Line. This one provides an astonishing 3,150 feet of cable and speeds of over 60 miles per hour, providing a true adrenaline rush like you've never felt before. 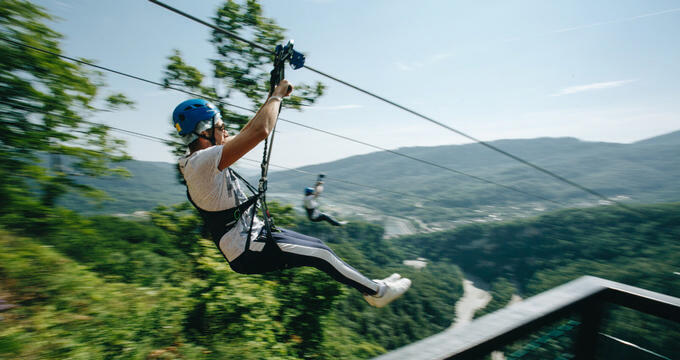 Grand Vue Park is one of the most scenically stunning spots in all of West Virginia, offering a full adventure park complete with mega jump, rope course, climbing tower, trampolines, and zip line canopy tours. There are two zip line tour options with this company: the Full and the Half course. As the names suggest, the Full course runs the full Grand Vue Park zip line circuit, with guests traveling along eight dual zip lines which range in length from around 300 feet up to 2,100 feet. The Full tour also includes three suspension bridges and lasts for three hours in total, offering incredible views of the surrounding park area. The Half tour is for people who don't quite have as much time to spend ziplining; it last just two hours and allows participants to enjoy half of the Full tour, i.e. four zip lines in total and two bridges. When signing up for any zip line tour or aerial adventure experience, there are a few important rules and restrictions to bear in mind. Most companies have minimum age and weight requirements for all zip line participants, and height requirements may also be in effect depending on the nature of the tour and the equipment being used. It’s important for all visitors to be aware of these requirements before booking a tour. In addition, when the day of your zip line tour finally arrives, it’s vital to dress and prepare appropriately. Bug spray and sunscreen can be essential in wooded areas on sunny days, and close-toed shoes are a must. Loose items can easily get lost or dropped while ziplining, so it’s important to have a secure bag or some other way of keeping your items safe. All guests will also be asked to sign a waiver and younger riders may need a parent or guardian present.